In India, like rest of the world, the life expectancy has increased, and thus, the percentage of old people or geriatric community has also increased within the general population. According to a recent news report, the percentage of elderly people above 60 years of age is likely to go up in India from 8% in 2015 to 19% in 2050. The country, thus, now faces the foremost task of how to take care of a large population of senior citizens whose number will grow 3-fold from around 100 million at present to 300 million by 2050. Most of the elderly in the country are in great distress at an age when they are most dependent on others for support. According to a survey conducted by an NGO, about 71% of elderly suffer from health problems, 65% from monetary distress, 63% from social difficulties, and 43% from psychological issues such as loneliness and marginalization. In India, as the lifestyle is constantly changing from joint families to nuclear families, the association of youth with elderly is showing a declining trend. Age-related prejudices keep on increasing due to changing demographic and sociocultural structure of society. These attitudes play a major role for health-care service providers. Their preferences toward specialized courses related to older people also depend on their attitudes toward old people. Therefore, health-care university students, who are future lifeline of any country, need to be more prepared for appreciative behavior toward elderly. In India, there is a strong need to sensitize the health-care providers to gerontology. The importance of gerontology to students was very much emphasized by MacEntee as he highlighted that dental students should be exposed to a consilience of the science and the humanities if they wanted to address well the needs of an elderly population. According to Bernard et al., attitudes are seen as a mediating link between clinical proficiency and performance and have a direct influence on applied actions. A systematic review done by Lovell had also reviewed the four main instruments utilized in measuring attitudes such as the Palmore's Facts on aging quiz, the aging semantic differential, Kogan's attitude scale, and the Maxwell–Sullivan attitude scale. Attitudes toward elderly can be very well evaluated by Kogan's attitude toward old people scale and lot many published studies have utilized this scale. In abroad, many studies exist in the literature; however, an extensive literature search yielded, few Indian studies which have aimed to evaluate the attitude of health-care providers toward elderly people. Therefore, this study was designed to evaluate the attitude of teaching faculties and intern students of our health-care university toward old people. Null hypothesis of the study stated that there exists no difference in attitude toward old people among all the four health science colleges in the university. The study was conducted in health-care University of Vadodara in Gujarat, India. Medical, Dental, Nursing and Physiotherapy colleges of the health science university were included in the study. The Institutional Ethics Committee with Approval No. SVIEC/ON/DENT/SRP/16029 granted ethical approval for the study. Teaching faculties and interns (except in nursing college where interns are not available according to the council, therefore, third and final year students were included) of various health science institutes of the university, treating elderly patients were considered as inclusion criteria of the study. The participants who refused to participate in the study were considered as exclusion criteria. In this study, a total of 369 teaching faculties and interns participated. Out of 369 participants, 248 were interns and 121 were teaching faculties. [Table 1] shows details of the total participants participated in the study. The participants were informed about the study through participant information sheets, and consent from all included participants was obtained. Questionnaire survey forms containing questions from Kogan's attitude toward old people scale were printed and administered in person to the participants. The Kogan's attitudes toward old people scale include a questionnaire consisting of 34 questions evaluated on a 6-point Likert scale. The scale comprised 34 items: divided as 17 positive and 17 negative statements. Odd numbered items contained a negative statement, while even numbered items contained a positive statement. Kogan's attitudes toward old people can be divided into three types: positive, neutral, and negative. The total score from all items can range from 34 to 204 with a greater total score representing a positive attitude and a lesser total score showing a negative attitude. A score of 102 is reflected as neutral attitude toward the older people. The filled up forms were collected and analyzed using one-way ANOVA and Tukey's post hoc test for statistical analysis. SPSS version 20 statistical software was used for analysis and P < 0.05 was considered statistically significant. In this study, a total of 369 teaching faculties and interns participated. Out of 369 participants, 248 were interns (along with third and final year nursing students [n = 44]) and 121 were teaching faculties. The demographic characteristics are represented by [Table 2], in which, a total of 143 males and 226 females participated in this study. It also represents the age groups of teaching faculties and interns of each college. One-way ANOVA as [Table 3] shows that the mean total score was highest for physiotherapy college (125.30) which represents better attitude as compared to other three colleges. A total mean score of all colleges including teaching faculties and interns was 121.80. Results of ANOVA show statistical significance P = 0.00005. Tukey's post hoc test for multiple comparisons as [Table 4] show comparisons between various colleges. 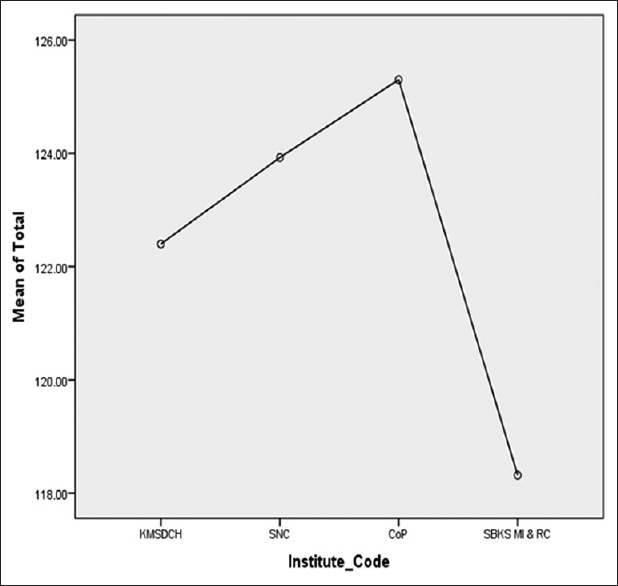 Dental college(P=0.010), nursing college(P=0.006), and physiotherapy college (P=0.000) show statistically significant results, although mean Kogan score came neutral only, for all the participating institutes. [Figure 1] shows mean total score of each college including teaching faculties and interns. Attitudes reflect an individual state composed of education, culture, personal values, and other characteristics which are capable of being very well modified with a suitable and custom-made intervention. Lot many earlier studies with diverse focus exists in the literature. The nursing, medical, physiotherapy, and dental college students and professionals have been independently evaluated in different countries for their attitude toward old people using various instruments. The results of the systematic reviews done by authors Liu et al. and Wang and Chonody on attitudes toward older people were quite unpredictable. Doherty et al. found positive attitudes of health-care workers toward older people in Ireland, but another study showed that education had least influence on the attitude of students toward old people. Medical students in Singapore showed a positive attitude toward the elderly. Ayoğlu et al. also reported that medical students demonstrated more positive attitudes toward older people than nursing students. According to the study done by Liu et al., Chinese undergraduate medical students showed positive attitudes toward the elderly. Another recent study done on attitudes of social gerontology and physiotherapy students toward the elderly concluded that even with the positive attitudes more efforts were required to enhance these attitudes by incorporating positive reforms in the curriculum. Turan et al. studied the attitude of health university groups toward older people and found that physiotherapy students were more positive than nursing students. The null hypothesis of the study was rejected, as there was statistically significant difference seen in mean Kogan's score toward old people among the medical college with dental, nursing, and physiotherapy college of health-care university. In this study, staff and interns of physiotherapy college showed mean Kogan's score of 125.30. Although physiotherapy college showed no statistically significant difference between nursing and dental, actually only in the curriculum of physiotherapy college the undergraduate students are formally trained and exposed to elderly people. This might be the reason that physiotherapy college students and staff are showing, in general, better attitude than all other three colleges. The results of this study clearly reflect that as no formal training about old people is provided in medical, dental, and nursing college the faculty and students answered the questionnaire solely based on their cultural, family, and personal experiences. Participant's age, experience, cultural background, family ties, and values along with social interactions must have led to self-learning. The overall results have shown to be neutral, which are not very encouraging. Patil et al. have very aptly stated that as the young graduates did not have adequate training and personal experience of growing old, they would not be able to understand the physical, socioeconomic, and psychological problems of the geriatric people. Thus, the intricacies involved in treatment planning for patients with multiple chronic diseases and medication would not be understood. They highlighted that geriatric dentistry should be part of the preclinical, paraclinical, and clinical subjects at the undergraduate level. A multidisciplinary approach with this special knowledge and skill would lead to improvement in the student's attitude. Marchini et al. conducted a comprehensive literature review about Gerontology in Brazil which was the first country to recognize it as dental specialty. They concluded that even after 15 years of incorporation of gerontology into curriculum still lot more needs to be done to improve the existing condition. Nochajski et al. very well suggested that general attitudes of students could be changed by exposure to older adults in clinical settings. Many professional education programs have already developed discipline-specific interventions for positively modifying the attitudes. These interventions consist of aging-awareness training, multi-modal interventions (e.g., didactic lectures, group activities, simulations, and mentorship),, clinical geriatric rotations,, and senior mentoring program along with the amalgamation of content on aging throughout the curriculum. The addition of an empathy-building module in a geriatrics-based intervention can also lead toward building a positive attitude toward elderly. Few of the limitations of this study are that it compared third year and final year nursing students along with interns of other colleges of health sciences. As the nursing council does not have the provision of interns, this study design had not much a choice. Participation from colleges was on a voluntary basis, which leads to very less participation from faculties in few colleges, which might have affected the results. Self-selection bias might also have occurred as a result of personal preferences of participants toward the topic. Another limitation is that age and gender of participants along with their association with elderly in their family background was not recorded and compared. Only one instrument was used for this study; thus, results should be interpreted with caution. The attitude should have been assessed with an additional questionnaire, which reports knowledge or facts about the older people. Future researches may address these issues. Future studies can also be conducted which can address the various factors which can lead to more positive attitudes of the health-care providers toward elderly. These findings can be considered very important starting point for the planning and training in health education curriculums. This need-based cross-sectional study very well reflects the present baseline scenario, which with future multicenter studies keeping in the account of diversity of training and cultural differences of various states of India may lead to positive reforms in curriculum of health science universities. 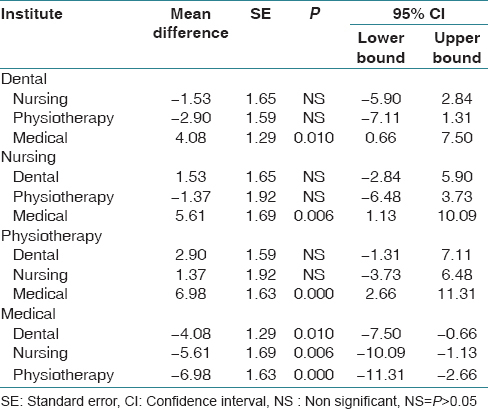 Within the limitation of this cross-sectional study, it can be concluded that as general attitude by mean Kogan's score was seen as neutral in all the four participating colleges, some positive reforms in the existing curriculum are desirable to strengthen the attitudes of health-care providers toward older people. There is also a constant need to organize continuing education programs and workshops to sensitize and improve the knowledge and attitude of health-care practitioners and students toward old people, on a regular basis. The authors are thankful to Mr Ronak Shah for his Statistical support. Bhatnagar GV. India Needs to Start Addressing Issues Concerning its Growing Elderly Population, Says UN; 20 June, 2017. Available from: https://thewire.in/politics/elderly-population-demographics-india. [Last accessed on 2018 Apr 27]. Bhatnagar GV. India's Elderly in Distress, Intervention Needed, NGO tells Centre; 28 July, 2017. Available from: https://thewire.in/politics/india-elderly-population-distress. [Last accessed on 2018 Apr 27]. MacEntee MI. The educational challenge of dental geriatrics. J Dent Educ 2010;74:13-9. Bernard MA, McAuley WJ, Belzer JA, Neal KS. An evaluation of a low-intensity intervention to introduce medical students to healthy older people. J Am Geriatr Soc 2003;51:419-23. Lovell M. Caring for the elderly: Changing perceptions and attitudes. J Vasc Nurs 2006;24:22-6. Kogan N. Attitudes towards old people: The development of a scale and an examination of correlates. J Abnorm Psychol 1961;62:44-54. Bernardini Zambrini DA, Moraru M, Hanna M, Kalache A, Nuñez JF. Attitudes toward the elderly among students of health care related studies at the university of Salamanca, Spain. J Contin Educ Health Prof 2008;28:86-90. Liu YE, Norman IJ, While AE. Nurses' attitudes towards older people: A systematic review. Int J Nurs Stud 2013;50:1271-82. Wang D, Chonody J. Social workers' attitudes toward older adults: A review of the literature. J Soc Work Educ 2013;49:150-72. Doherty M, Mitchell EA, O'Neill S. Attitudes of healthcare workers towards older people in a rural population: A survey using the Kogan scale. Nurs Res Pract 2011;2011:352627. Sheikh RB, Mathew EE, Rafique AM, Suraweera RS, Khan H, Sreedharan J. Attitude of medical students toward old people in Ajman, United Arab Emirates. Asian J Gerontol Geriatr 2013;28:85-9. Cheong SK, Wong TY, Koh GC. Attitudes towards the elderly among Singapore medical students. Ann Acad Med Singapore 2009;38:857-61. Ayoğlu FN, Kulakçı H, Ayyıldız TK, Aslan GK, Veren F. Attitudes of Turkish nursing and medical students toward elderly people. J Transcult Nurs 2014;25:241-8. Liu Z, Pu L, Wang H, Hu X. Survey of attitude towards and understanding of the elderly amongst Chinese undergraduate medical students. Asian Biomed 2014;8:615-22. Kaker DJ, Ovsenik M, Zupancic J. Attitudes of social gerontology and physiotherapy students towards the elderly. Organizacija 2016;49:55-69. Turan E, Yanardag M, Metintas S. Attitudes of students of health sciences towards the older persons. Nurse Educ Today 2016;36:53-7. Patil PG, Ueda T, Sakurai K. Influence of early clinical exposure for undergraduate students on self-perception of different aspects of geriatric dental care: Pilot study between two colleges from Japan and India. J Indian Prosthodont Soc 2016;16:288-93. Marchini L, Montenegro FL, Ettinger R. Gerodontology as a dental specialty in Brazil: What has been accomplished after 15 years? Braz Dent Sci 2016;19:10-7. Nochajski TH, Waldrop DP, Davis EL, Fabiano JA, Goldberg LJ. Factors that influence dental students' attitudes about older adults. J Dent Educ 2009;73:95-104. Stuart-Hamilton I, Mahoney B. The effect of aging awareness training on knowledge of and attitudes towards older adults. Educ Gerontol 2003;29:251-60. Moriello GR, Smey JW, Pescatello LS, Murphy MA. Influence of an educational intervention on pre-allied health students' attitudes toward older adults. Gerontol Geriatr Educ 2005;25:1-1. Shue CK, McNeley K, Arnold L. Changing medical students' attitudes about older adults and future older patients. Acad Med 2005;80:S6-9. Baum EE, Nelson KM. The effect of a 12-month longitudinal long-term care rotation on knowledge and attitudes of internal medicine residents about geriatrics. J Am Med Dir Assoc 2007;8:105-9. Scheffler SJ. Do clinical experiences affect nursing students' attitudes towards older adults? J Nurs Educ 1995;34:312-6. Jansen DA, Morse WA. Positively influencing student nurse attitudes toward caring for elders: Results of a curriculum assessment study. Gerontol Geriatr Educ 2004;25:1-4. Samra R, Griffiths A, Cox T, Conroy S, Knight A. Changes in medical student and doctor attitudes toward older adults after an intervention: A systematic review. J Am Geriatr Soc 2013;61:1188-96.